A natural product extracted from brown algae (of Laminaria, Fucus, and Macrocystis genera, among others) that grow in cold water regions of Ireland, Scotland, North and South America, Australia, New Zealand, South Africa, etc. Depending on the part of the algae that has been refined, the texture and Calcic reactivity of each alginate varies. 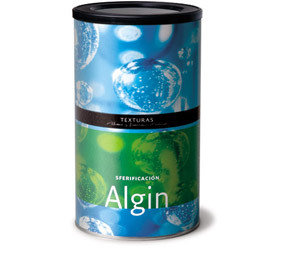 For this reason, we have selected Algin as the ideal product for achieving Spherification with guaranteed results. Presented in a refined powder. Gels in the presence of Calcic. Dilutes while cold with strong agitation. It need not be heated to produce Spherification.